I don’t think it’s any great secret that Melbourne’s buses aren’t very well co-ordinated to the trains — with two exceptions that is, the Trainlink buses at Epping and Cranbourne, which are timed to meet every train. This is a major problem because so many trips simply can’t be made on PT without using a combination of services. If the connections are too difficult or time consuming, people just drive instead. It’s easy in places like the CBD and inner-suburbs where there’s a tram every few minutes, every day of the week. But in many cases in the middle and outer suburbs, it’ll involve a bus — most of which are woefully infrequent. And there you have the crux of why PT is well-used in the inner-burbs, but cars dominate further out. But how do you prove the connections are crap? Compare the timetables. Finally with the help of the government’s release of all the timetable data for the entire state, and a lot of crunching of the data, it’s been done. Well, mostly — it was damn tricky to get it all together, and it wasn’t possible to match all the bus routes to their stations. If you get off a train from the city, looking for a bus, you’ve got a 37% chance of a connection (that is, a bus departing on the route you want, any time between 3 minutes after the train arriving, and 3 minutes after the next train turns up). If there is a connection, you’ve got a 42% chance that you’ll have to wait more than 10 minutes for it. The average connection time is 11.2 minutes. You won’t be surprised to hear that on weekdays, connections are better than the averages above. On Saturdays they’re a little worse, and Sundays are the worst of all. In some cases those connection times are so long that they exceed the time you might have spent just driving all the way to your destination. Or you can run all major services (trains, trams, arterial road buses) frequently; say every 10 minutes. Then without even trying, the average connection time will be 5 minutes. Smartbuses (on weekdays) come close to this. No wonder they’re popular. If only there were more of them, more people would take the option of leaving the car at home more often. Is there a cost estimate for the 10 mins to everywhere? If it’s such a good idea, and I feel that it is, then what’s stopping any political party from taking any interest? Seriously, it’s as if they don’t want to do anything, ever. Minor changes here, slight changes for 2020, blah blah, why aren’t they seriously looking at the 10 minutes to everywhere? PTUA needs to start running candidates in local areas to stir up public interest, and shove a rocket under the Libs and Labour to commit to some real, immediate changes. It’s not just the connections that deter us in the outer suburbs- it’s need! Our needs aren’t the same as those in the inner city! Within the inner city radius, PT will get you anywhere! For someone like me here in Dandenong North, unless I want to go into the city, PT isn’t all that viable! Taking the bus from one outer suburb to another is so time consuming, it is much easier to go by car! As as example, for me to go to work on Wellington Rd, Mulgrave, it would take me almost half an hour by bus- 10 minutes by car. And besides, I start work at 6AM, so PT is useless at that time! Besides, I prefer going by car- it is more convenient for me, as I will carry around large items. That’s what deters us out here! Mikeys, not yet but it’s being worked on. Andrew, everyone makes their own decisions about how they travel. But one shouldn’t assume that what suits yourself suits everybody else too. If you regularly have to travel carrying heavy/large items, PT is not going to cater for you, no matter how good it is. But most people don’t. It will never get all the cars off the road, but it can do a lot better than it does now. Remember, it’s already been shown what works in the outer suburbs. Lots of people are using Smartbus services. The one serving Dandenong has so far got 40% patronage growth per year. Even just thinking very simply, my bus line, the 517 runs every 24 minutes on weekdays, whereas trains on the Hurstbridge line run every 20 minutes during the middle of the day. This is a ridiculous situation where the wait times are wildly fluctuating, with some waits being over 20 minutes long and some connections where one literally needs to run from the station to the bus stop. Simple solution? Run the buses every 20 minutes to at least have consistent connections. 10 minutes to everywhere, I completely support. If people don’t have to think about public transport getting in their way, they they’ll be more inclined to take it. We have most of the infrastructure, and for less than the cost of a new freeway we’ll have a very, very strong pt network. On several occasions I have had to take PT from Ringwood to Dandenong (very much against my will but did do it) Checking the options I found it around on a par or quicker to get a train from Ringwood to Richmond (express BOX-CAM-GFE-BLY) and another back out to Dandenong (express SYR-CFD) than to catch the supposedly improved Smartbus between Nunawading and Springvale stations for the main part of the journey. The time stops, drivers having to bugger around selling tickets and annoying little detours to nearby shopping centre bus loops mean that the services are not really a meaningful choice for a long trip, but rather a short connection to a train, assuming ones journey is largely radial to the city. Andrew S, the 40% is, I believe, in comparison to the routes it replaced. In the case of the Frankston-Dandenong-Ringwood service, it replaced a couple of other routes I think. Yes, part of the Smartbus upgrades is to simplify the routes and straighten them out, in fact I think the recent change to the Springvale to Nunawading route removed the deviation to Forest Hill shopping centre. Doncaster P+R and the 401 North Melbourne-Melb Uni shuttle are already prepaid only. I wonder if there’ll be a push to make other routes prepaid only in future, particularly if/when Myki is working properly? Smartbuses would probably be prime candidates. 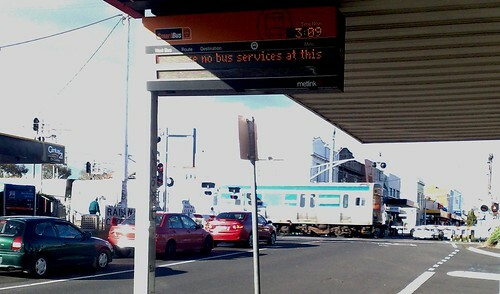 These days the 901 takes just under an hour in peak to travel Dandenong to Ringwood. But ultimately I suspect they’re more useful for shorter trips than for long cross-town journeys. The reason buses leave stations two minutes before the train arrives is simple. They are bringing passengers to the station so they can catch the train. Uhh, no. Are you just trolling? It might be arguable if the trains to the city are at the same time as the trains from the city, which they mostly aren’t, and if the bus/train frequencies matched, which they mostly don’t. I have some Ideas that a younger than a 15 year old boy like me can suggest. The Smartbus currently going from Frankston-Ringwood will be extended to Tullamarine via Plenty Valley Epping and Roxburgh Park and that means that bus route 571 currently going from Roxburgh Park should not exist. Other reasons are Roxburgh Plaza Expansion and Plenty Valley rail extension. .People from Plenty Valley and Roxburgh Park to get to there nearest station at Epping until the Craigieburn Electrification and Plenty Valley Rail Extension. Well the bus/train connection works both ways. From train to bus, and from bus to train. And the majority of mixed-mode journeys will involve commuters make a transition of each of the two types on either their outward or homeward journey. If the bus is on a “collector” route, it can arrive at the station 3 minutes before the train, hang around for 6 minutes, and drive away again 3 minutes after the train, and everyone is happy. Except…. trains run in 2 directions. But if the bus route is crossing the train route and continuing, then having the bus waiting around for 6 minutes is deeply annoying to any passenger who is staying on the bus,. @enno (hanging around for 6 minutes) – that’s why there’s a push for every 10 minutes to everywhere, so buses don’t have to hang around at all. For the “lesser” bus routes – any thought on their desired frequency? Half-hourly would be a vast improvement for a lot of bus routes. And if they could be spaced exactly 30 minutes apart all the time (easy to memorise timetable). At present, there’s a bus route in Melbourne that runs to a frequency of … (drum roll) …. It’s a bus route extension from Belgrave to Dandenong, from memory. Its all very well to say buses should run every 30 minutes, until you actually have to schedule them. If it takes the bus 50 minutes to make a round trip out and back to the station on some suburban service, then thats how long it takes. Put on two buses and you can have a service every 25 minutes. The bus driver can sweep the bus for five minutes. Or use the toilet. I recollect that, counter intuitively, the expected waiting time is actually 10 minutes. I do a monthly tram sample around 9pm Tuesday in Royal Pde and find that this is born out in practise.